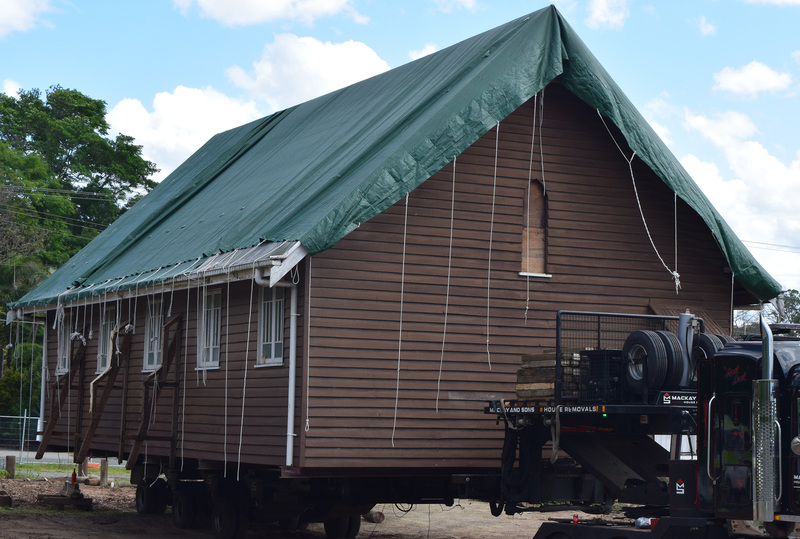 Today I drove south of Brisbane to the suburbs because for some people in Rochedale a big move was happening and I was asked to record it for history’s sake. For most people in the area it was the little brown church on the corner, but it is a building with a lot of history. As the older parishioners will tell you, the church was made out of wood salvaged from an American World War Two barracks. During WW2 Brisbane was the headquarters for the South West Pacific campaign, with places like the University of Queensland being converted into the advanced headquarters for the Allied Land Forces. The legacy of WW2 and the American presence still exists across Brisbane and St. Philips Anglican Church is but one reminder of it. But like all things, the march of progress is upon the area as Rochdale is transformed from a rural enclave into a new residential/commercial suburb, and the time for the little brown church on the corner has come to an end, of sorts. 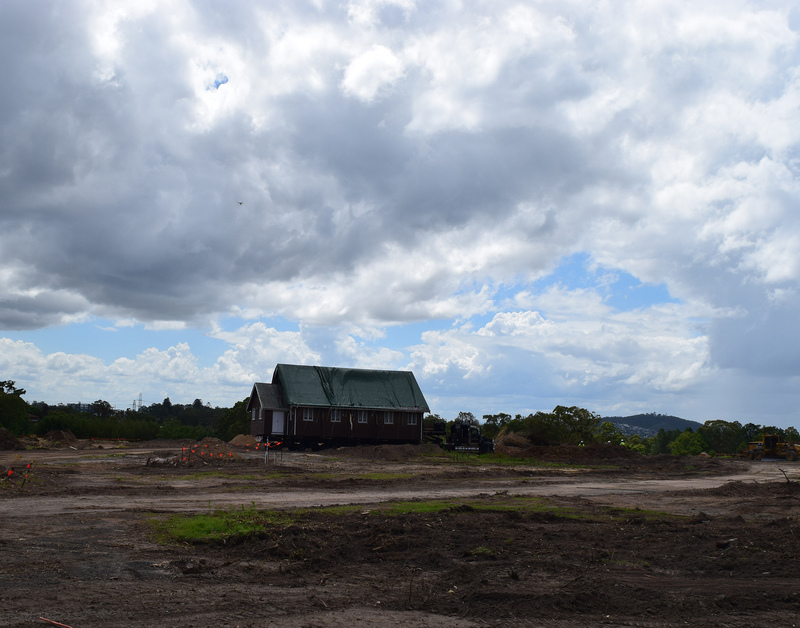 For the land it is on will soon to be turned into a traffic intersection so the choice was to move it or destroy it and Coles Supermarkets the new owners decided to give it a new lease of life as a community centre. However, it is an old building, and an old building that needed to be moved, and that precarious endeavour is what we are looking at today. Just a warning that there are a lot of images after the fold, so if you are on mobile you might want to check that you are on wifi. 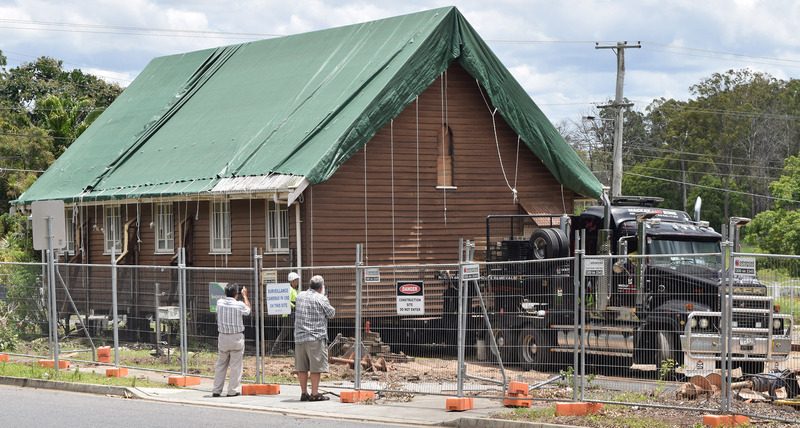 For some it was an emotional day, there was a lot of love for the old brown church on the corner, it was a fixture for the area, and this was a big change. Also it was a very old building so for some they wondered if it would even make the trip in one piece. It took a long time but after some work the movers were finally able to get their truck under the church after using jacks around the building to lift it off its foundation piles. This was painstaking work because they had to remove the building’s buttresses that were supporting it and add extra support to keep it from imploding. On a side note ‘buttresses’ are my second favourite architectural term, if you guessed ‘flying buttresses’ was my first, then congratulations, you just won pointless Brian trivia. Of course it took a long, long, long time to get everything right, so there was some time to wonder around and enjoy some of the flowers around. However after a number of hours the movers finally got the church lifted and the jacks were removed. However, this is the most difficult part because it was the moment when you find out the hard way if all your work in trying to keep the building from falling apart worked or not, and it was a success. 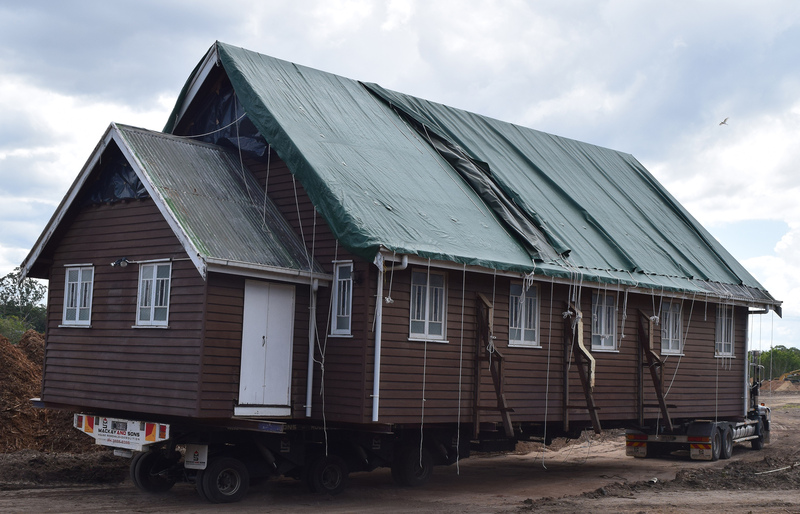 It was slow and steady but inch by inch the church began its move to its new home, which is not far, but each step was a treacherous one. As the move continues the local wildlife circles wondering what is going on, which matched the cars coming around the corner of the intersection and stumbling across this fascinating site. However, while the move continued the sky deciding that it was going to be simply stunning as the clouds rumbled across the heavens. It was not a long trip, but for a building that old it was a dangerous one. At each gust of wind you could see all the people watching to move hold their breath. 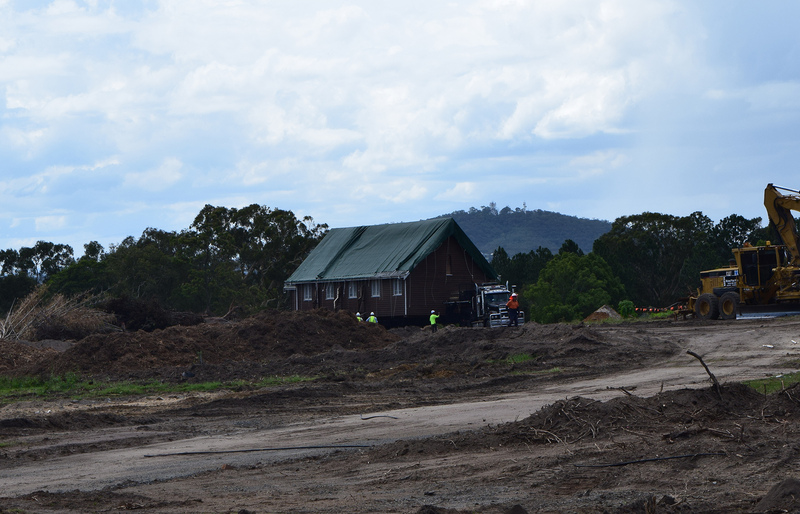 But after a long move the old building came to a rest on its new home, ready for an extensive renovation to bring it back to its former glory. Have you visited UQ during Jacaranda season?, let us know what you thought in the comments below, feel free to share this review on any of the social medias and you can follow us Here. Check out all our past reviews and articles Here, and have a happy day. This entry was posted in Articles, Explore-It and tagged Australia, Explore-It, Historical, Moving, Photography, Queensland, Real Life, St. Philips Anglican Church by tldrmoviereviews. Bookmark the permalink.